Wholesale soft glass water pipes offer many advantages over standard pyrex water pipes. They tend to be made out of thicker glass and with bright vivid colors that stand out across a room. 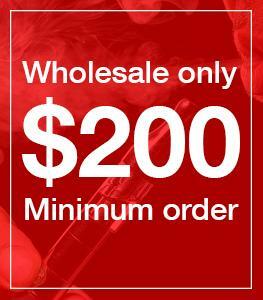 Unlike standard pyrex lab glass water pipes, wholesale soft glass water pipes will typically be priced cheaper. Soft glass bongs can compliment your inventory of pyre bongs. They offer a good comparison in the possibilities of what can be done with glass blowing. The contrast of the two different types of bongs will help each of them sell better to the customers that appreciate that type of glass artwork. It is always best to have a diversified inventory of bongs to allow the customer to have more choices so they can then gravitate toward the piece they feel best suites their needs and personality. Why is it called soft glass? Soft glass gets its name from how malleable the glass is. When melted the glass is soft and acts kind of like taffy. You can poor it, shape it, and even cut it with special scissors. Pyrex glass that is used to make standard bongs comes in rigid tubes that are them shaped into the final piece. Larger pyrex glass water pipes are made on a lathe that spins the glass tube while a torch heats it up. With soft glass you heat up the glass and then you can mold it, and even blow it into the final shape. Some soft glass water pipes are made in molds that the glass forms to when blown into it. A lot of the larger more intricate pieces are heated up on the end of a long hollow pole and once hot the glass blower will literally blow through the pole to expand the molten glass into a bubble shape. They will will continue to tweak the design and reheat it as necessary to continue to be able to work the soft glass. Once done with the final shape they will use special scissors to cut the glass away from the tube. What are some advantage to soft glass water pipes? Soft glass water pipes offer a few advantages over standard pyrex water pipes. Firstly they tend to cost less than pyrex bongs. It is not always the case, but more often than not you can pick up a soft glass bong for less than a comparable pyrex bong. Soft glass bongs also tend to be made of a thicker glass. Since we are all worried about dropping our bongs this can be a deciding factor when picking up a new piece. Larger soft glass bongs can be 2 or 3 times as thick as comparable pyrex bongs. The most notable difference is that soft glass has extremely bright colors. Unlike pyrex glass tubes that bongs are made from, soft glass naturally is made up of super bright colors that make the bongs stand out anywhere they are seen. What is the difference in glass on glass and standard bowls? When choosing the right bongs for your store you want to make sure you pick what will sell. Standard grommeted down stems and o-ring bowls have been the industry standard for years now. They are inexpensive, but serve their purpose. The grommet and o-ring will eventually need to be replaced, but they can sometimes last longer than the glass will. In scientific lab glass using glass on glass fittings has been the norm since inception. The basic idea is that you have two glass joints and each one of them is frosted, or sandblasted. When you place the joints in each other they lock together because of the friction from the sandblasting. Obviously with this type of joint there is no need to use a grommet or o-ring to seal things together. The down side of gong bowls and down stems is they cost more. So if your store is in an area where low cost is a priority then going with standard bowls and down stems may be the right choice for your customer base. What different styles of wholesale soft glass bongs are there? Soft glass bongs come in so many shapes, styles, and colors. The shapes will vary depending on how the bongs were made. If they were blown then they can have a bubble shape at the base with a long stretched neck. When using a mold to make bongs the glass will come out to whatever the shape of the of the mold is. Sandblasting on soft glass can leave the reverse image from whatever graphic you choose to put on it. This technique can make a single colored bong look more appealing to customers by em-blazing a custom design on it. Even though we use the term soft glass when talking about this style of bong there are different types of glass that can incorporated into the soft glass work. Dichroic glass can be used to give a glittery reflective look to the bong. Dichro comes in strips and is layed into the soft glass when blowing the piece. Millies are often added to soft glass to give the piece a dynamic textured look. If you don;t melt the milies in all the way then it will give the bong a raised look, but ig you work the piece even more the millies will just melt into the surface of the bong and blend in with the soft glass. When choosing bongs for your retail head shop or smoke shop soft glass bongs make a lot of sense. They offer the lower price point that your customers will appreciate, but with the features that modern bongs user have come to expect. Here at Aux Ark Trading we keep our inventory of wholesale soft glass bongs current with some of the newest styles on the market, and at prices you can make plenty of profit on. This ensures you have continued successes in your retail store, and happy customers that will return time and time again.